You've got a Programmable Wireless SIM in your device, and you want to configure the capabilities of the SIM such as international access, voice and SMS. By the end of this topic, you’ll have a better understanding of Rate Plan properties and how to set them. 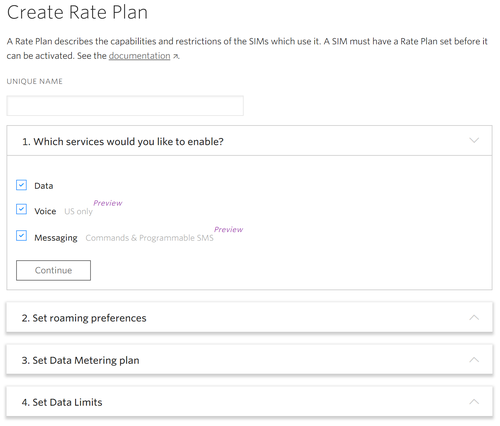 A Rate Plan describes the capabilities and restrictions of each and every SIM associated with it. Multiple SIMs can be configured to use the same Rate Plan. SIM usage is and enforced on a per-SIM basis. For example, if your Rate Plan has a Data Limit of 5MB, each SIM will be able to consume 5MB of data per month. I'm ready. Let's create a rate plan. From the Programmable Wireless section, click Rate Plan. Click the red + button to open the Create Rate Plan form. Let's give the plan a unique name. A user-provided string that uniquely identifies this Rate Plan. Let's select the type of SIM. Messaging includes two capabilities - Commands and Programmable SMS - because Commands, under the hood, are powered by SMS protocols. National roaming allows SIMs to roam onto other networks in the United States. With the current Twilio SIMs, this means roaming onto other US operators where possible. National roaming has a separate data limit and is billed per MB. If the national roaming data limit is unspecified, the default value is the lesser of Data Limit and 1000MB. International Roaming allows SIMs to roam on partner networks outside of US. All data consumed while roaming is billed per MB and has a separate Data limit. Programmable Wireless does not currently support International Voice. Make sure you set your device's APN to wireless.twilio.com so that you can use data. Let's select type of data metering plan. You can go through the Help Me Choose wizard or if you know what plan you want, just select the plan. Two types of Data Metering Models are available. When a Rate Plan uses the PAYG Data Metering model, data is metered at the byte level billed in 100KB increments on a per-SIM per-network basis. When a Rate Plan uses a Quota-based Data Metering model, you'll save money on a per-MB basis in every country by agreeing to a minimum data spend per SIM per month. See the Pricing documentation for details on how data is billed and examples of Quota-based data metering. This is a hard cap enforced by the network for each SIM. Data is disabled for the remainder of the monthly recurring charge (MRC) period when a SIM reaches the limit. Can I modify an existing Rate Plan? No. Rate Plans are immutable, meaning they cannot be modified after creation. Create a new Rate Plan and move your SIMs to it. Can I create new a Rate Plan? Yes. You can create a new Rate Plan in the Console or through the Rate Plan API. Can I change the Rate Plan associated with a SIM? Absolutely, you can change a SIM's Rate Plan at anytime. Select the SIM and click the Choose button to the right of the existing Rate Plan. I’ve got a Rate Plan associated with my SIM, what’s next? You've got your Rate Plan associated with your SIM and an understanding of how Rate Plan properties work. Continue to the final section of the Getting Online guide to learn about SIM Statuses.